Car insurance, like most insurances, can seem complicated. Deciding just how much car insurance coverage you need is the biggest hurdle. Of course, it’s easy to select the coverage that meets the requirements of your state and the lien holder (of you owe on a loan for the car, you’ve got a lien holder, and it’s likely the bank you borrowed from), but those aren’t the only factors to take into account when deciding on how much coverage you need. In the end, you’ve got to find a coverage that will meet those requirements, and also fit within your budget. You’ll want to know what the state requires you to have for insurance. Any local insurance provider should be able to tell you, but you’ll want to double check if you’re planning on using an out of state or online provider. If you still owe on your car, the lender on your loan will likely require that you have full coverage, so the state minimums will likely only come into play if you own the car you’ll be insuring. If you owe on your car, you’ve got a lien holder. The lien holder is whomever you borrowed the money from. Most (if not all) lenders will require that you carry full coverage insurance on the car. It has nothing to do with them wanting to make sure you’re safe, and all to do with making sure that should you get in an accident, that they’ll get some of their money for the loan. While most lien holders won’t require a certain level of insurance (over full coverage), it is a good idea to find out what they require just to make sure that you’re getting the coverage that you need. Once you know the requirements of the state and any lien holders, you’ve got to decide on the level of car insurance coverage you want. There are two ways to look at this. The first is that you’ve got to find a coverage and provider that is affordable enough to fit into your budget. The second is usually the forgotten way of looking at insurance. The coverage doesn’t just have to fit into your budget, it also needs to cover you against a total loss. If you have full coverage, but it’s only enough to cover a portion of what you owe on the car, you’ll also want to look at something that’s usually called “Gap Insurance”. Gap insurance is aptly named in that it is designed to cover any gap between the value of the car and the remaining loan should the car be totaled before you pay it off. Car insurance can be a combination of three coverages. A liability coverage (usually what States require), Comp & Collision, and personal injury. The exact levels that you need will vary based on your situation, but your insurance provider should be able to make recommendations for you. One of the easiest ways to lower the monthly cost of your car insurance coverage is to raise the deductible on your policy. This method is a bit of a double-edged sword, however. Raise it too high, and you might not be able to afford to have the car fixed. 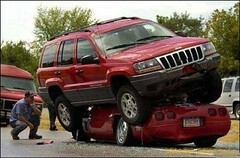 Or, anything short of a major collision may fall under the amount of the deductible. Again, your insurance provider should be able to help you compare the different deductible levels and help you find one that fits your budget without breaking you if you get in an accident. The level of coverage that you need is going to be drastically different based on your own individual situation. Do you own your car, or owe on your car? Do you have sufficient savings to cover a higher deductible in an emergency? What are the requirements of your state and any lien holders? Make sure you know all that information before you go looking for car insurance, and remember to double check any suggestions by an insurance provider. We’d all like to think that they are all honest, but not all of them are. Knowing at least a little about what you’re talking about, and the information required to ask informed questions is a huge step towards not getting taken advantage of. How much do you know about car insurance? How much have you learned since the first time you bought insurance? One of the tenet that I am trying to live by financially is to pay cash for as much as possible. There are certain things that I won’t be able to do that for. A house is the most likely example there. Many people would lump a car in with that category as well. Not here. This rule accomplishes a few things for you. By paying cash, you don’t have any monthly payments. By paying cash, you are also forced to buy a car that you can actually afford. No more $45,000 cars on a $70,000 salary. Beating Broke Rule: Buy Used. A new car depreciates in value more in the first few minutes of ownership than it does in the next year. The second that you sign the paperwork and the dealer hands you the keys, a new car loses a large percentage of it’s value. In some cases, this can be 10-15%. By buying used cars, someone else has already paid for that depreciation and now you can enjoy the lower depreciation of the car through the years. And if you go with a car that’s only a few years old, it’s almost like a new one anyways. Beating Broke Rule: Don’t Lease. Why would you want to pay someone several hundred dollars a month to drive their car only to give it back to them in the end with no value back? And if you think you need to lease so you can have the smaller payment, you should be looking at a cheaper car in the first place.